To return to recent News and Events click News & Events, or use the links at the top or bottom of the page. 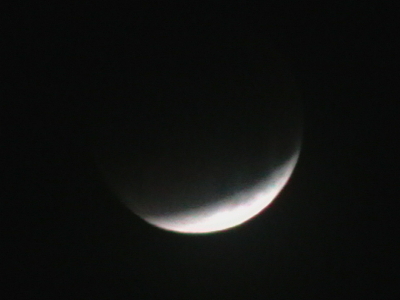 28-Sep-15, A Total Lunar Eclipse on the night of 27-28th September. 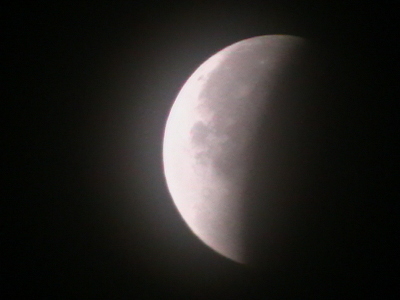 The total lunar eclipse was mostly viewed with clear skies and excellent views, although a little thin cloud and haze did intervene at one point. These pictures were taken near Creetown, and other photos should be forthcoming from the main meeting at Glentrool in the near future. 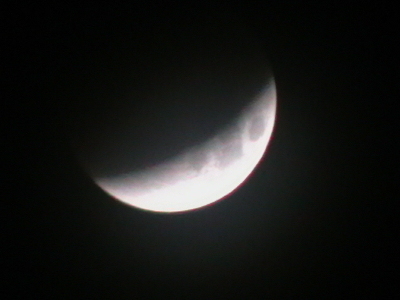 The Earth's shadow gradually obscures the moon. 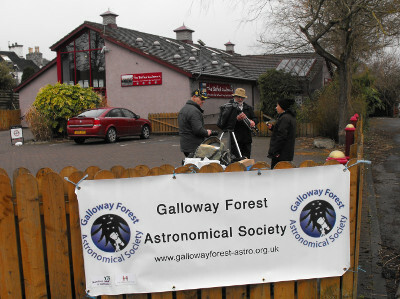 20-Jun-15, Solar Observation Meeting at the Belted Galloway, Newton Stewart, from 11 am to 1 pm. 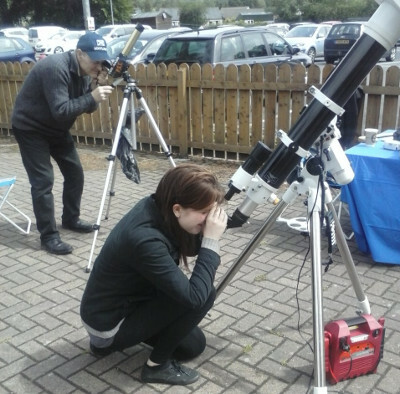 Our solar viewing event began with cloud, but as time went on this began to thin and some breaks appeared, allowing us to view sunspots on the surface of the sun. Interested visitors were able to view the sun safely through our two specially protected telescopes for a close-up view, and through our solar spectacles for a normal view. Using a new camera we were able to record high quality images of the sun's surface to clearly show the sunspots. These images were then processed to select only the best and clearest ones, which were then “stacked” or merged in the computer to produce the final image shown above. Thanks are due to the Belted Galloway for the use of their premises, and to Brian and Robin Rice for the use of their new camera and other equipment, and to all those that helped to make a success of the meeting. Viewing the sun through specially protected telescopes. 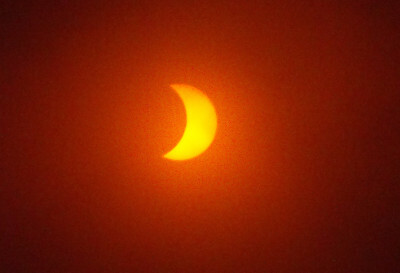 One of the special filters used to protect viewers from the sun. 20-Mar-15, GFAS hits the front page of i, the sister paper of the Independent! Just before the eclipse date, our Chairman was approached by a freelance photographer asking for a photo shoot in preparation for the eclipse. 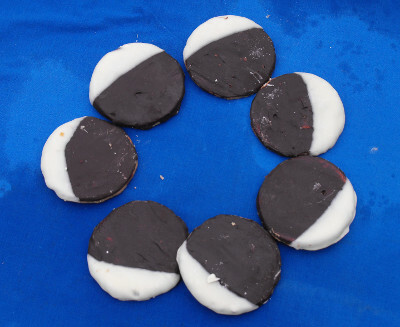 This was arranged and then on the day of the eclipse, there they were on the front page, with another photo and short piece on page seven. Fame at last! 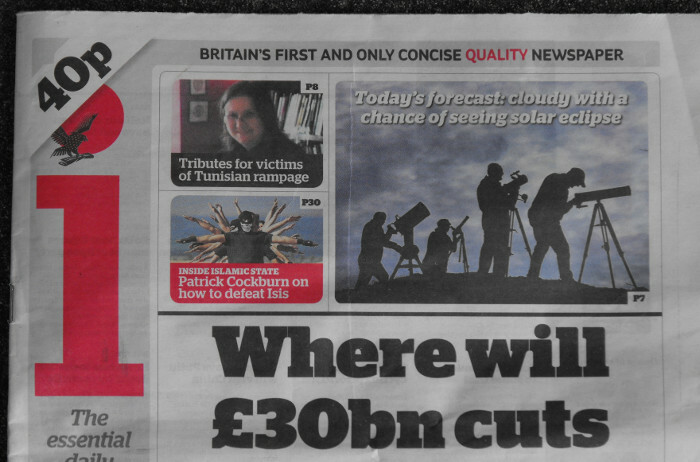 GFAS members hit the front page of the national press! The inside story with another picture. 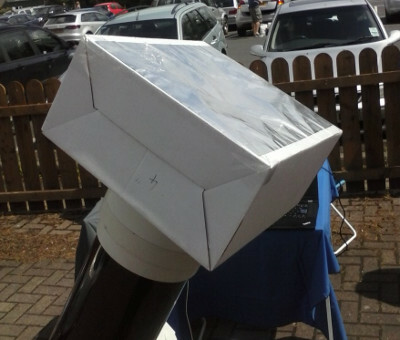 20-Mar-15, Meeting to view the solar eclipse, from 8.30 am to 10.30 am, the Belted Galloway, Newton Stewart. The morning dawned grey and cloudy as a weather front lay over Newton Stewart. 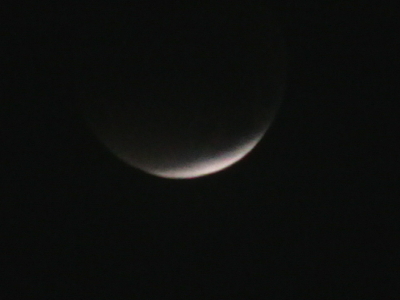 It was only after the eclipse had been going for about forty minutes that the cloud started to thin and brief glimpses could be seen. 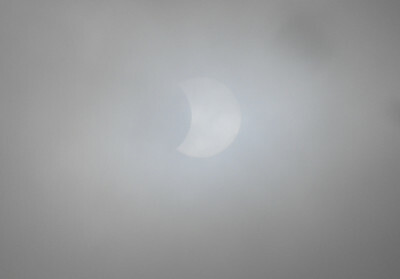 Viewing conditions remained difficult with the cloud thickening and thinning, then a short brighter spell required the solar filter to protect viewers, giving a reddish hue to the photographs, before the thicker cloud moved in again. 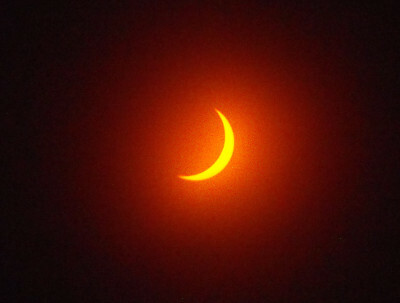 It was unfortunate that the timing of the weather front coincided with the eclipse, but we were also very fortunate to be able to view some of the eclipse through thinner cloud around the maximum, giving us the chance to record some photographs of the dramatic event. Thanks are due to the Belted Galloway for allowing us to use their premises, and to the Creebridge House Hotel for making a special batch of Eclipse buscuits! 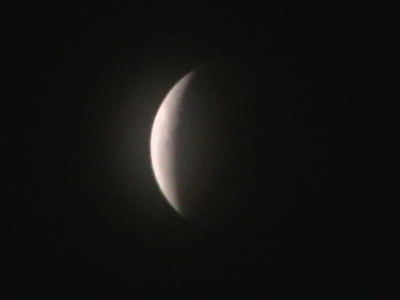 The first picture, just before maximum, through cloud. 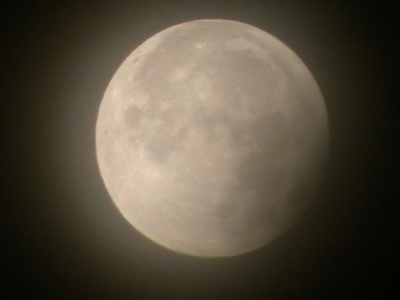 Just after maximum, through a solar filter. 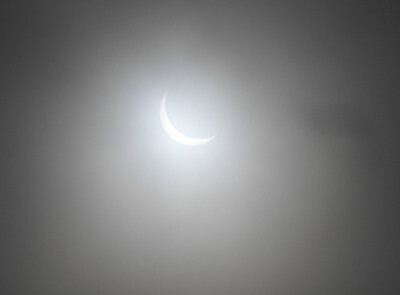 The moon moving off the sun, solar filter and cloud. The last glimpse before the cloud takes over again. by the Creebridge House Hotel. Putting the equipment away after the eclipse. 22-Feb-15, Processing images to improve their quality, at the Newton Stewart Golf Clubhouse. M51 is a spiral galaxy to be found near the handle of the Plough, imaged by Brian and Robin Rice. The meeting went ahead although the cloud meant that the conjunction of Venus and Mars was not available to view, but because of the hospitality of the Newton Stewart Golf Club, we were able to use the Clubhouse to go through the process of stacking images taken earlier. 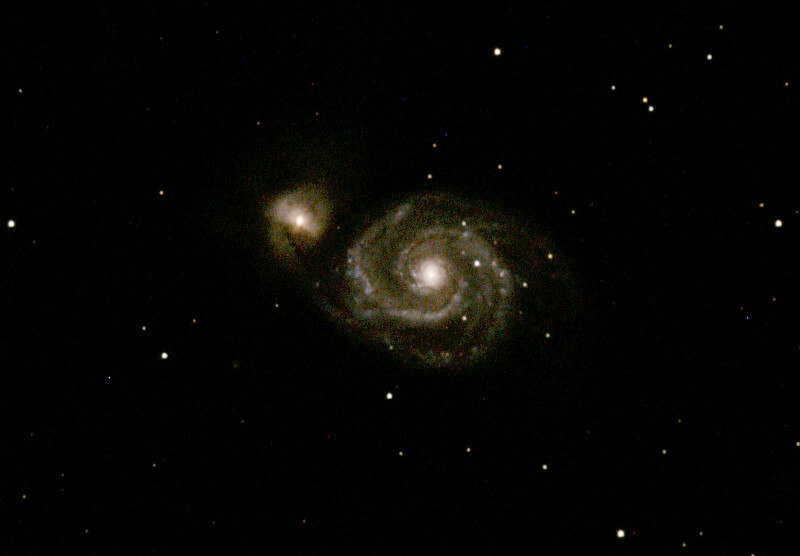 The image above of M51 is the result of taking a number of images and "stacking" them together to give a clearer and more detailed image, and it was one of the images processed that evening. Several other images were taken through the process, along with an interesting discussion on all aspects of astro-photography and working with the images obtained. Thanks go to Robin for leading the session, and to the Golf Club for making the clubhouse facilities available to us.